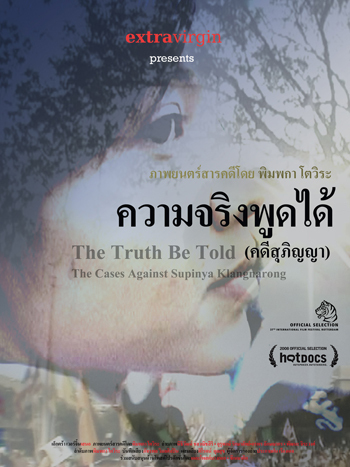 A chronicle of the crucial moment in the life of Supinya Klangnarong, a Thai media activist and Secretary-General of the Campaign for Popular Media Reform (CPMR), in her fight against the 2003 defamation charges from Shin Corporation, the telecommunication giant owned at the time by the family of former Thai Prime Minister Thaksin Shinawatra. The case was filed against her and the daily newspaper Thai Post following her published article which suggests a conflict of interest due to the government’s beneficiary policies for the corporation. As a result, she faced both criminal and civil libel suits, threatening for 400 million Baht (11 million USD) and imprisonment. Although the charges were later dropped in March 2006, this vicious lawsuit that had been haunting her life through this 3-year period has become a part of her, as well as serving as a political instrument over the course of the time. Does this victory of hers spark hope for the rest of us, that the freedom of speech may just help bringing about a change in the Thai society and politics? Or is it just in our thought that it can change? THE TRUTH BE TOLD was produced independently through private investments. 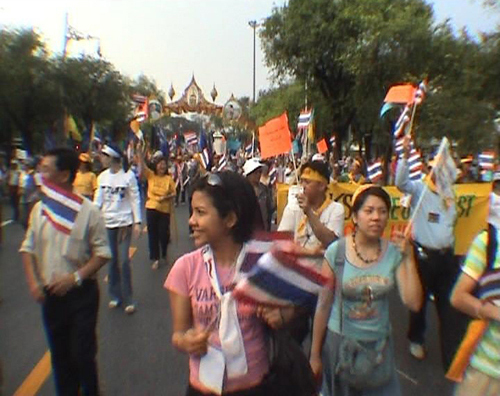 The production took place over the course of two and a half years following the lawsuit and its consequences – on Supinya personally as well as on the Thai media and social movements. At the same time, Thailand’s political landscape was also going through radical changes, culminating in the 2006 coup d’?tat and its aftermath.